Following the repeal of Title II protections for the internet by the FCC in December, there’s been a public outcry that hasn’t gone unnoticed by lawmakers and telecoms. AT&T is just the latest company to flamboyantly proclaim that it loves net neutrality, despite the fact that the Sunlight Foundation reported it tied as the top spender trying to kill the regulations. 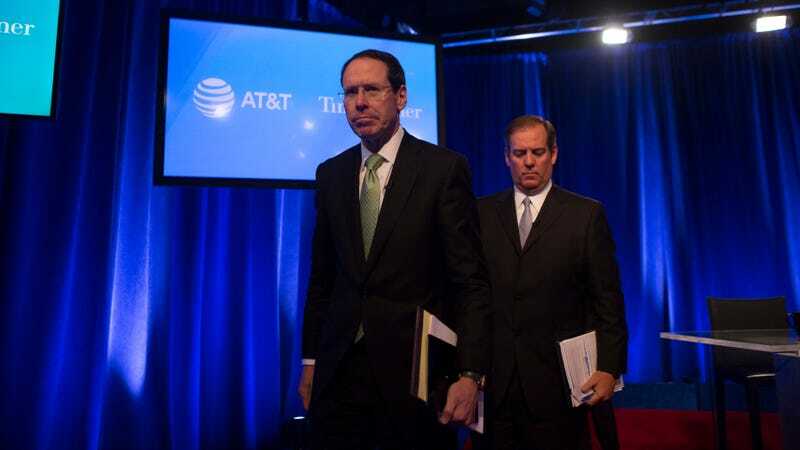 In today’s ad, AT&T CEO Randall Stephenson made a number of disingenuous claims while calling for new laws that would protect the internet, and he dragged tech companies into the mix. Stephenson begins by explaining that rules governing the internet keep changing and it’s “understandably confusing” for customers and businesses. But the latest change probably wouldn’t have happened if his company and the other telecoms didn’t spend $572 million lobbying US government agencies over the the last nine years. He then says that while lawmakers figure out some sort of permanent solution, AT&T “is committed to an open internet.” But like his colleagues at Comcast, his pledge to customers leaves much to be desired. “We don’t block websites,” Stephenson writes. “We don’t censor online content. And we don’t throttle, discriminate, or degrade network performance based on content. Period.” That promise is just saying that it hasn’t changed the policies it had under the previous protections. At no point does Stephenson say that his company won’t do any of those things. Gizmodo has asked AT&T if it will pledge to never do any of those things and will update this post if we receive a reply. Ultimately, Stephenson throws in a curve ball by suggesting non-ISP tech companies like Google need to be regulated to protect net neutrality, complicating the issue. “Congressional action is needed to establish an ‘Internet Bill of Rights’ that applies to all internet companies and guarantees neutrality, transparency, openness, non-discrimination and privacy protection for all internet users,” he writes. As Harold Feld, senior vice president at the consumer advocacy group Public Knowledge, told The Washington Post, “The sad fact is that AT&T and other companies have used the ‘but what about Google’ argument as a distraction since the net neutrality debate was 5 minutes old.” But the recently repealed Title II protections were about ensuring that telecoms treat all traffic on the internet equally and don’t throttle or block websites they don’t like. If Google or Amazon became a major ISP, net neutrality would be about them as well. Right now, this is just a shiny object that AT&T is dangling in front of lawmakers who are increasingly upset with Silicon Valley. It’s unclear how, exactly, AT&T thinks this all-encompassing legislation should affect tech companies, but it’s obvious who it wants writing the law. According to Stephenson, “we intend to work with Congress, other internet companies and consumer groups in the coming months to push for an ‘Internet Bill of Rights’ that permanently protects the open internet for all users and encourages continued investment for the next generation of internet innovation.” Ah yes, let’s all trust the company that wanted to kill net neutrality (and is still facing a $100 million fine for violating the previous rules) with writing the new legislation. This is the big telecom playbook in a nutshell. They want to temper public anger by acting as if they’re just trying to get some reasonable laws on the books when a perfectly reasonable rule already existed. They argue that uncertainty slowed investment in broadband under Title II when the exact opposite is true. As a result, they gets headlines like “AT&T Calls for Congress to Pass Net Neutrality Law” and “AT&T endorses net neutrality.” Meanwhile, friendly lawmakers like Marsha Blackburn step up with terrible legislative giveaways to these pseudo-monopolies, and legislators who honestly don’t know what’s going on get to say they fixed the problem. Stephenson’s suggestion that “all internet companies” be included in whatever legislation goes forward is a transparent effort to set up some rules that’ll benefit his company while hurting non-ISP competitors in the quest for big data. There are plenty of good reasons why companies like Facebook should face expanded regulation regarding privacy protections and other issues, but let’s not conflate these issues. Facebook doesn’t determine whether or not it’ll take an hour for a website that’s critical of AT&T to load. Google doesn’t determine whether a website for a company that competes with AT&T will be blocked. Twitter doesn’t decide if customers should pay extra if they want to watch Netflix. At the moment, the best option on the table is for Congress to reverse the FCC’s decision to repeal Title II protections through the Congressional Review Act. Right now, the Senate is one vote shy of passing that legislation. It would still have to get past the Republican-controlled House and Trump’s veto pen. If that fails, sign up to get text messages about who voted against net neutrality and vote out the shills. Then try again in 2019. There’s always the option to just turn Title II into a bill aimed at ISPs if they want to complain about the uncertainty of the FCC reversing its decisions. The most important thing to remember is that companies like AT&T are the least trustworthy players in this game, and whatever they think is the best course of action should be thoroughly ignored.